Harrington Park School is a K-8 school serving 643 students from kindergarten through eighth grade. The school facility consists of approximately forty-five classrooms, one computer lab, a school/district wireless computer network supported by three mobile laboratories, two full-size gymnasiums, an outside field consisting of three separate sporting areas, a walking track with exercise equipment, a learning courtyard, and a television studio through which a daily live schoolwide news broadcast is offered to the school community. Students from kindergarten through third grade receive their primary instruction from individual classroom teachers who deliver content in Languages Arts, Math, Science, Social Studies, Reading and Handwriting. Students also take special subject classes in Physical Education, Art, Music, Computers and Foreign Language. Students from fourth through eighth grade receive their instruction from individual subject-matter specialists. Students move throughout the building and meet with teachers dedicated to specific content and topic areas. Specific instruction is offered in Reading, English, Science, Math, and Social Studies. Students also continue their special subject study in Physical Education, Art, Music, Computers, Character Education, Math Operations, Research & Learning and Foreign Language throughout these years. 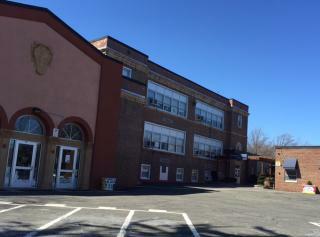 As a K-8 building, Harrington Park School has a variety of athletic, academic, and extracurricular offerings. Some of these include: Student Council, Band, Chorus, String Ensemble, Jazz Band, Green Club, Debate Team, Garden Club, Yearbook, School Newspaper, co-ed Soccer, boys and girls Basketball, girls Volleyball, Baseball, Softball, and co-ed Track and Field.